From the Bay Area artist’s recent Everybody Works album. 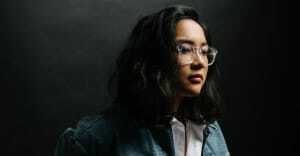 Jay Som, a.k.a. Melina Duterte, has shared a new video for "One More Time, Please," a track taken from her recent Everbody Works album. The clip, directed by Christopher Good and Andreina Byrne, is an anxiety-inducing trip and finds the main character obsessively covering her hands in glitter as she sings, "I'm not okay/ I don't feel like "come here.'" "We wanted to honor the heaviness of Melina's lyrics by channeling the essence of madness many feel while attempting to live up to societal standards, behaviors or even personal obsessions," Good and Byrne explained. "This madness can become mentally and physically enslaving. We follow the main character as she attempts to satisfy these standards/obsessions until she realizes her obsession with such is more of an internalized threat." Jay Som's Everbody Works album is out now via Polyvinyl Records and Double Denim. See her upcoming North American tour dates below.